Short Irish Jokes: Not Only Hilarious, They Are ... Well... SHORT! Short Irish Jokes: Easy to Remember, and Oh So Hysterically Irish! When we tell short Irish jokes, we wrap the full range of Irish humor, wit and wisdom into a few memorable words! And we make people laugh! These jokes from / about Ireland are special because they are ... well ... short! For those of us with limited memory, but a desire to show our Irish side in a humorous way, these may be just the ticket. And for many, many more Irish jokes - don't miss our main section on Irish jokes here. I know ... shocking right? Here is your opportunity to blend two favorite Irish pastimes, drinking and making each other laugh. See what you think of these! please, don't interrupt! Yes it is possible! 2) make sure that you have locked the bathroom door. "Paddy," said Murphy, "how does it happen that when you drink, you can’t remember people’s names?" "I don’t know," said Paddy, "it's a gift." Many short Irish jokes are about the differences between men and women. They are not always the cleanest, most politically correct, or flattering ... but they are very often the funniest. Please forgive us in advance ok? And enjoy! Question: Do you know why hurricanes are all named after women? Answer: When they come, they are wet and wild. When they go, they take your car and house with them. A woman was in bed with her lover, telling her how stupid her Irish husband was. At that moment, the husband came home. “What are you two doing? !” he asked. “Didn’t I tell you that he was stupid?” the wife answered. Ok, ouch. On behalf of all Irish husbands, I'm a touch offended by that! Question: Do you know what an Irish husband is? Answer: A man who has not kissed or touched his wife in 20 years but would kill the man who tries to. “Daughter! Go home, squeeze seven lemons and drink it straight down,” the priest said. “Will it help?” she asked. “Father, I have just shot down two British lieutenants and I knocked off a British captain,” O’Donnell said in one breath. Finnegan is drunk as usual. He walks into the church and goes straight to the confessional box. There is silence. The priest waits for Finnegan to start talking. He waits and waits. Finally, the priest pounds on the wall of the confessional box. Had enough? Good! Neither have we! Irreverent humor is an essential part of Irish culture and heritage. 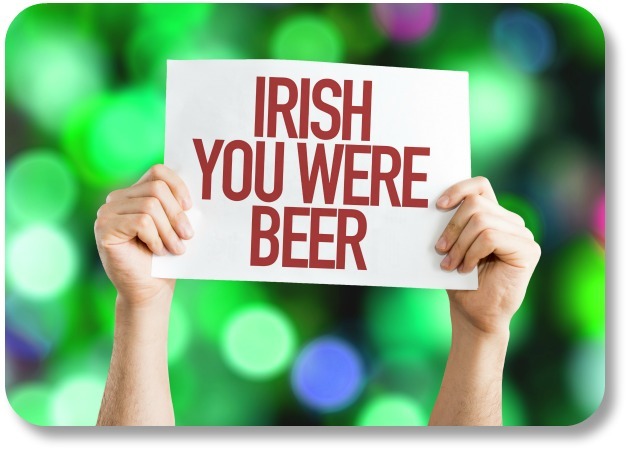 Sharing jokes like these during special occasions can help you celebrate your personal Irish side! For more information of this type, you may want to visit our main section on Irish jokes here.